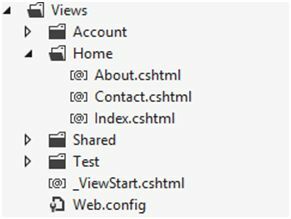 @model string < input type = "hidden"
ASP.NET MVC 6 Hosting - HostForLIFE.eu :: How to Registering Custom Directories For Views In ASP.NET MVC? The same is the case for partial view when we call return PartialView(), it first looks in the respective controller's Views/Home directory in the case of HomeController and in case of failure it looks in the View/Shared folder. Views/Home/Partials and Views/Shared/Partial then we have to tell the ViewEngineto look in that directory as well by writing the following code in Gloabl.asaxfileinApplication_Startevent. In this case also we will get the same exception as Engine will not be able to find the View file _LoginPartial.cshtml. The beauty of asp.net mvc framework is the extensiblity which you can do according to your needs and business requirements, one of them is that if you want your own directories structure for organizing your views you can register those directories with razor view engine, doing that will make your life easy as you will not have to specify fully qualified path of the view, as razor will know that it needs to look for the view in those directories as well which you have registered with it. So what we have to do is to register this directory pattern in the application so that every time we call any View it should look in those directories as well in which we have placed the View files. So here is the code for that. 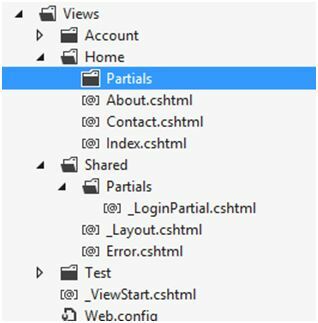 Now whenever we will call return PartialView("SomeView") it will look in that Controller Views directory's subdirectory named Partials as well and in case it not finds there it will look in both Views/Shared and Views/Shared/Partials. The same way you can register other directories or your own Custom directory structure if you need to, so doing this way you will not need to specify complete path for like return View("~/Views/Shared/Paritals/Index.cshtml"), instead you can just write then return View() if you want to load Index View and your action name is also Index which is being called, or if you want some other view to be rendered or some other action is invoked and you want to return Index view then you can write return View("Index"). Dependency injection (DI) has been possible in previous versions of MVC. With each new version DI has been easier to implement and, with MVC6, DI is supplied right out of the box. In this article we’ll look at how the new DI implementation works, what are its weaknesses and how we can replace it with our favorite DI framework. The unification of APIs across ASP.NET is a common theme throughout ASP.NET 5, and dependency injection is no different. The new ASP.NET stack including: MVC, SignalR and Web API, etc. rely on a built-in minimalistic DI container. The core features of the DI container have been abstracted out to the IServiceProvider interface and are available throughout the stack. Because the IServiceProvider is the same across all components of the ASP.NET framework a single dependency can be resolved from any part of the application. Let’s walk through setting up DI in a MVC application. To demonstrate the basics, we’ll resolve the dependency for the service used to get project data. We don’t need to know anything about the service other than that it implements the IProjectService interface, an interface custom to our demo project. IProjectService has one method,GetOrganization(), that method retrieves an organization and its corresponding list of projects. We’ll use the IProjectService to get the organization data and display it in a view. Let’s start by setting up the controller where the service will be used. We’ll use constructor injection by creating a new constructor method for our controller that accepts anIProjectService. Next, the Index action will callGetOrganization, sending the data to the view to be rendered. If we try to run the application at this point we’ll receive an exception because we haven’t yet added a concrete implementation of ourIProjectService to the DI container. InvalidOperationException: Unable to resolve service for type 'DependencyInjectionMVC6Demo. Services. IProjectService' while attempting to activate 'DependencyInjectionMVC6Demo. Controllers. HomeController'. The exception message shows that the code fails during a call toActivatorUtilities.GetService. This is valuable information because it shows that in MVC6 the DI container is already involved in the controller’s construction. Now we just need to tell the container how to resolve the dependency. In order to resolve the dependency, we need a concrete implementation ofIProjectService. We’ll add a DemoService class and, for simplicity, it will use static dummy data. Finally, we’ll instruct the DI container to instantiate a new DemoServicewhenever IProjectService is required. To configure the container we’ll modify the ConfigureServices method in Startup.cs. Our configuration will be added to the end of this method. The service is added by using the AddTransient extension method on the services collection, and setting the IProjectService as the type of service and the DemoService as the implementation. With the service added, DemoService will now be instantiated when the controller is created, and the exception will no longer be thrown.